The SX230 is a pre amplifier designed and manufactured by Biometrics and has been developed with ease of use and superb quality of signal in mind. Unique to the design is the Input Impedance of >10,000,000 M Ohms. What this means in practise is that little or no skin preparation and no gels or creams are required, yet the quality of the signal recorded is absolutely superb for both static and dynamic applications. Simply apply the electrodes over the body of the small or large muscles being measured using the die cut medical grade double sided adhesive tape (part no. T350). Independent of the number of active EMG sensors being used at any one time, only one ground reference cable is required. For applications where variable inter-electrode distance is desired - the SX230FW EMG Amplifier has the same superb signal pickup of the SX230. Instead of the integral electrodes of the SX230, the SX230FW has two flying wire leads for use with any reusable or disposable SEMG electrode incorporating a 4 mm snap. The maximum inter-electrode distance is 200 mm and the minimum distance is dependent upon the size of the electrodes used. 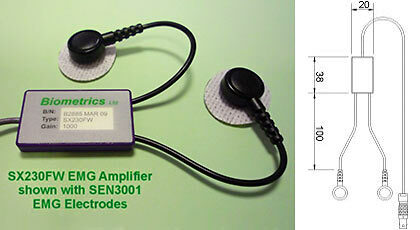 The SEN3001 surface EMG electrode may be used with the SX230FW. The SEN3001 is a small (22 x 28 mm) silver/silver chloride EMG electrode designed for single or multiple applications to the same patient/subject. The cable R306 comes with a standard 2 mm spring plug for connection to proprietary disposable electrodes with a 2 mm spring socket. R506 comes with a standard 4 mm snap connector to use with proprietary reusable or disposable electrodes with a 4 mm snap. The preamplifiers are attached to either the DataLOG or DataLINK and the EMG default settings are chosen within the Management software. 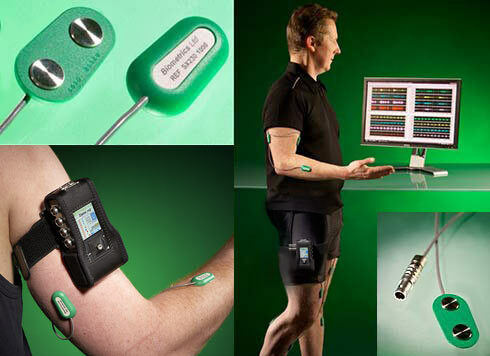 EMG raw data is collected and analysed within the analysis software. The DataLOG provides a fully portable system with built in adjustable audible alarms per channel. The DataLINK provides in depth real time display and analysis with adjustable audible alarms per channel. Differential electrodes to detect low level signals in a noisy environment. Very high input impedance (>10,000,000 M Ohms) to minimise the differential pickup due to mismatches in skin contact resistance. With other commercially available systems the significantly lower value of input impedance makes the skin preparation critical and the quality of signal is reduced in dynamic applications. A high-pass filter to remove DC offsets due to membrane potentials. The Biometrics sensor includes a third order filter (18bB / octave). A low-pass filter to remove the unwanted frequencies above about 450Hz. It is very important to remove these high frequencies when interfacing to a computer that is sampling the signal since they would be converted to a lower frequency and mixed with the original signal. The SX230 includes an eighth order elliptic filter (-60bB at 550Hz). A low noise instrumentation-amplifier front-end with a common-mode rejection ratio of typically 110 dB.